Historic wooden tabernacles were constructed in the late 19th and early 20th century in Texas for a variety of purposes, including religious gatherings, veterans reunions, burials and other community events. Principally located in north, central and east Texas, these modest timber structures are usually open to the elements, with a gable or hipped roof covering rows of benches. While a handful are listed as Record Texas Historic Landmarks, most tabernacles go unnoticed and are not protected by local or state regulations. The Old Settlers and Veterans Association Tabernacle was constructed in 1914 in Tomlinson Hill, near Marlin in Falls County. It was constructed to serve as a reunion ground for Confederate veterans, early Falls County pioneers and their descendants. In 1936, the Morrell Cabin was relocated from eastern Falls County to the site. Two smaller, mid-20th century structures provided shelter for cooking and serving meals at annual events. Some 75 years after pioneers opened this region, the “Old Settlers Association of Falls County” was organized on July 4, 1908. In 1909, the Willis L. Lang Camp of Confederate veterans and the settlers held a joint reunion. Merging later, they chartered the “Old Settlers and Confederate Veterans Association of Falls County” in 1911. Goals were to memorialize deceased comrades, honor the pioneers, and preserve southern history. Signing the charter where John M. Jolly, Edmund Pierson, and J. H. Robertson of Marlin; R. B. Bratton of Kosse; N. R. Watkins and F. O. Porter of Lott. This 17.9-acre permanent reunion ground was acquired in 1912 from the family of J. K. Tomlinson, an 1858 settler from Georgia who, along with a son William, enlisted and died in the Civil War. In 1936, an historic log cabin was relocated here–to exhibit pioneer memorabilia. A new charter in 1946 renamed the organization the “Old Settlers and Veterans Association,” signifying its opening to the soldiers of later wars. Patriotism, education and historical preservation are still stressed. Falls Countians in state and national life reflect ideals which have been instilled by this association. 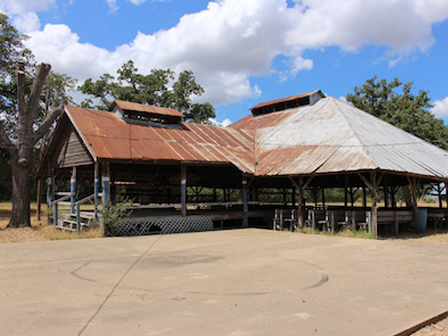 Restoration and protection of the tabernacle and the log cabin will ensure that two very unique historic structures in central Texas can continue to serve as a draw for those seeking to understand our past, and as an example to others working to preserve and restore historic tabernacles and log cabins. PT Board Visit: September 2015. PT Staff Visit: February 2016, May 2016.